Heavy military vehicles were used to damage the site, according to a statement from Iraq’s ministry of tourism and antiquities that didn’t provide further details. ISIS continues to “deny the will of the world and the feelings of humanity,” the ministry said. It called for a UN Security Council meeting to discuss how to protect cultural heritage in Iraq. Nimrud was founded in the 13th century BC as part of the Assyrian civilization and lies about 30 km south-east of the northern Iraqi city of Mosul, which was captured by ISIS in June. The destruction of archaeological and religious sites has provoked global condemnation. The head of UNESCO has condemned the destruction of the ancient Assyrian city of Nimrud in Iraq by the ISIS group, saying it amounted to a “war crime”. A tribal source from the nearby city of Mosul told Reuters the ultra-radical Sunni Islamists, who dismiss Iraq’s pre-Islamic heritage as idolatrous, had pillaged the 3,000-year-old site on the banks of the Tigris River. A video emerged last week showing militants attacking ancient statues in the Mosul Museum with sledgehammers. The city’s library containing 8,000 ancient manuscripts is also reported to have been burnt down. Iraq reopened its national museum in Baghdad last week for the first time in 12 years to defyISIS efforts to “destroy the heritage of mankind and Iraq’s civilization,” Prime Minister Haider al-Abadi said. Ruins of the ancient city remain at the northern Iraqi site, however, which has been excavated by a series of experts since the 19th century. British archaeologist Max Mallowan and his wife, crime writer Agatha Christie, worked at Nimrud in the 1950s. In July it destroyed the Tomb of the Prophet Jonah in Mosul. It has also attacked Shiite places of worship and last year gave Mosul’s Christians an ultimatum to convert to Islam, pay a religious levy or face death by the sword. It has also targeted the Yazidi minority in the Sinjar mountains west of Mosul. doing so just adds to the shock and horror propaganda the militants want to demonstrate. and has tweeted: "Stand off at bardo museum over. Police killed two of the gunmen and captured one. #Bardoattack" BBC reported earlier here:At least seven foreign tourists and a Tunisian have been killed after gunmen targeted a museum in the the Tunisian capital, officials say. Tourists from several European countries were taken hostage, a local radio station reported. 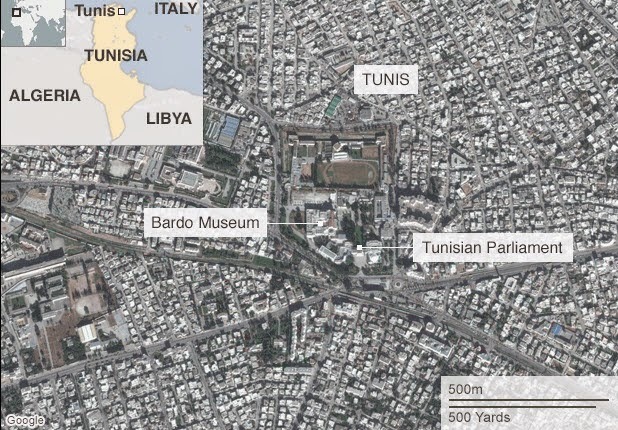 The shooting happened at the Bardo Museum, which is next to the parliament building in central Tunis. In a further attack on cultural heritage, Islamic State has begun burning books and manuscripts in Iraq. In January, militants broke into the Central Library of Mosul, and took away more than 2,000 books to be destroyed, including children’s stories, poetry, philosophy and scientific volumes, some dating from the Ottoman Empire, the Associated Press reports. Residents near the Central Library of Mosul were told by an Islamic State official that “these books promote infidelity and call for disobeying Allah. So they will be burned,” a local man told AP on condition of anonymity for fear of retaliation from IS. A few days later, the group staged a similar attack on the University of Mosul’s library, where they built a bonfire from hundreds of books in front of students. A history professor at the university, who also spoke to AP on condition he not be named, said Islamic State struck other public libraries in December, causing extensive damage at a Sunni Muslim archive, the holdings of the Latin Church and Monastery of the Dominican Fathers and the Mosul Museum Library, which houses objects dating to 5000 BC. Update: According to Charles E. Jones, who moderates the IraqCrisis mailing list, sources in Mosul and Baghdad have been unable to confirm the reports of the libraries being destroyed. Anyone with information is encouraged to contact IraqCrisis, or leave a comment below. Antiquities traffickers continue to make headlines in multiple countries in 2015. In this three part series, ARCA explores current art trafficking cases to underscore that the ownership and commodification of the past continues. Tuesday, investigative reporter Simon Cox's "File on Four" program on BBC Radio 4 featured a radio segment titled "Islamic State: Looting for Terror". A synopsis of the episode on antiquities looting in its written form, and with accompanying video excerpts, is available on the BBC News Magazine website here. The full audio of the radio program is available in MP3 format here. The program illustrated, with present-day examples, how illicit antiquities trafficking sells cultural heritage objects that are often poorly protected, difficult to identify, and easy to transport across international boundaries, especially during conflicts due to the flow of refugees. The radio broadcast featured interviews with both London and Middle East experts, one of whom, Dr. David Gill of Looting Matters, validated that conflict antiquities do make their way into the UK art market and from there on to collectors. But rather than recount the program's content, which on its own deftly underscores that the illicit market in conflict antiquities is alive and producing devastating results for source countries like Syria and Iraq, this article focuses on the buyer's side of the market and explores the attitudes of complacent dealers who too often treat the furor over smuggled antiquities as a bothersome nuisance that interferes with their ability to make living. In the world of crime, morals follow money. Not wanting to enter into the ongoing oppositional debate with antiquities dealers or collectors, I decided to spend some time listening to the folks involved in the trade as they talked with one another about collecting and the collecting market. Too often heritage protection advocates get pigeon-holed as the noisy minority of academic archaeologists who oppose acquisition of unprovenanced ancient art. My goal was to be anything but noisy, and to merely observe. Publicly, pro-collector blogs frequently argue that nationalistic retention laws for antiquities neither preserve sites nor objects, nor do they benefit the larger interests of civilization and mankind. But what do collectors and dealers have to say to one another about their own responsibility to preserve site? And how do they truly feel when it comes to merchandise that enters the art market as a result of the illicit antiquities trade? To get a better understanding I started by reading through the websites of the International Association of Dealers in Ancient Art (IADAA) and the Association of Dealers & Collectors of Ancient & Ethnographic Arts. Both the IADAA and the ADCAEA's mission statements advocate for the responsible and legal trading and collecting of antiquities. promote awareness and understanding of ancient and ethnographic art collecting through open communication with members and the public. support the preservation and protection of cultural objects around the globe through responsible and legal trading and collecting. educate and inform members on policies and laws that affects the international movement of cultural property. advocate and support the establishment of clear, transparent and fair laws governing acquisition, ownership and commercial disposal of artifacts. promote a Code of Conduct that underscores the professionalism of our members through responsible and ethical practice. advocate the establishment of a comprehensive digital database register within the USA to secure appropriate title to art and artifacts for museums, dealers and collectors and restore legitimacy and value to objects registered. Good objectives to strive for even if I found their December 29, 2014 blog post a lot more threatened and defensive as this opening paragraph shows. As a result, several American museums have been coerced into giving objects to foreign governments that have claimed them as their rightful property purely for political purposes. American collectors and art dealers as well have been forced to repeatedly defend themselves against all manner of claims by foreign governments for countless pieces of art work that have been dispersed around the globe. Increasingly, Americans have had to defend themselves in costly litigation against foreign governments who use American lawyers, US Customs, and Homeland Security, and the Press to pursue spurious claims against US citizens. At the same time these foreign nations do very little to protect their archaeological resources or stem the tide of illicit excavation on their own soil. The old paradigm of “antiquities collecting equals destruction of cultural heritage and therefore must be abolished” is naive at best and slanderous at worst. To understand the reason for this defensiveness among dealers and collectors I thought it worthwhile to listen to them chat amongst themselves in non-official capacities, perhaps learning about what drew them individually to the field rather than assume I understood how dealers and collectors truly feel by looking at their safety-in-numbers mission statements. Wording for large public statements often makes for adversarial lines in the heritage protection sand. I joined several collecting groups in hopes of better understanding "their side of the story". Clearly heritage protection professionals and dealers and collectors should be able to solve their differences if if there is goodwill on all sides. The lesson is clear here. The best overall strategy to preserve mankind's shared global heritage is NOT to keep it all concentrated in the original source countries, but rather to widely distribute it around the world. Hopefully they will loot and sell them first rather than destroying them! But then we dealers would probably be charged with funding terrorism by our wonderful politically correct governments. I have bought many ! objects of ' fetishes and gods' from Moslem Runners who have no problems selling these pieces; nor do I have in buying then. apparently referring to the secular nature of some Muslim looters and smugglers who don't necessarily subscribe to the religious ideology of Isis, Isil or Da'ish when selecting antiquities for trafficking. I would like to share with you my thought regarding how a piece you end up buying in auction like Bonhams or Christie's is actually looted. - A poor farmer in Egypt finds it while plowing his land. - Middle man sells it to the big boss in Cairo. - Then an invoice is made from a dealer in another European country e.g. Belgium, to this Portuguese dealer for the piece, of course nobody checks, it's an EU transaction, no tax , no customs. - Based on the Belgian invoice, the Portuguese dealer make an export license to U.S.A from ministry of culture, piece origin from Belgium, this totally cancels the fact that the piece came from the Arabian gulf. - Item sold in auction + old European collection, legally entered to U.S , customs paid. Do ethics even enter into collector-dealer purchase discussions? For some yes, but too frequently no. In listening to collectors' observations I found that not all were black sheep. While some over-sharing group members aired their profession's dirty laundry, others called for restraint in purchasing and recommended that dealers and collectors stick to objects with verifiable collecting histories. Some dealers and collectors reached out to one another to help determine if a piece had value, was original or knew someone in the business who might have information on the object's past in the antiquities marketplace. At face value their motive appears to be less driven by ethics and more by the desire to preserve value for money on object purchases and investments. Objects with sketchy pasts are still money spent in purchase but make for risky investments. Some dealers and collectors outed dealers known to have sold fakes or to have had problems with previous law violations like Mousa Khouli who also goes by the name Morris. Dealers reminded new members of the group that Khouli had sold through Windsor Antiquities as well as Palmyra Heritage, and through eBay as palmyraheritagemorriskhouligallery. Several group members pointed out pieces that they found problematic on Khouli current auction events such as this listing for an Ancient Roman Egyptian Painted stucco Mummy Mask c.1st century AD and this Palmyran Limestone Head Ca. 3rd-5th century A.D. I myself notice he trades in Syrian coins, ancient glass and mummy cartonnage. 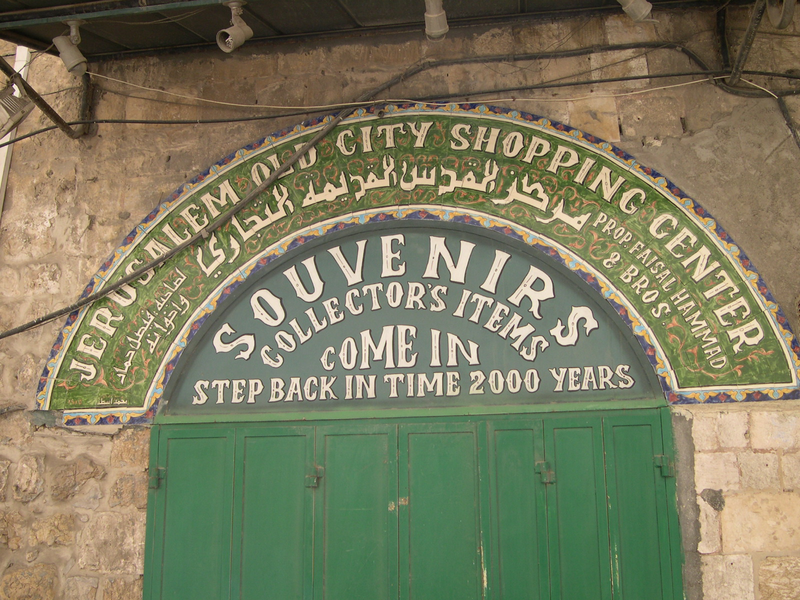 Khouli is not new to the art and antiquities profession. He moved to New York City with his family from Syria in 1992 and opened a gallery specializing in the ancient world in New York City in 1995. His father had a gallery in Damascus for 35 Years, and he learned the business from his grandfather who also worked in the art and antiquities collecting field. When prosecuted in 2012 he was already a seasoned and substantial seller in the New York market. But Khouli eventually pled guilty to smuggling ancient Egyptian treasure and to making a false statement to law enforcement authorities. He was sentenced to six months home confinement, one year probation, and 200 hours of community service, along with a criminal monetary assessment of $200. Today he continues in the business he knows, the buying and selling of history. Everyone's at it, he just happened to get caught. Interestingly, like with the How To Smuggle recipe the earlier dealer described, Khouli's smuggled objects were imported via Dubai. Maybe the one thing heritage workers and the collection community should agree on is that the "white" (clean) art collecting trade is dirtied when black market antiquities are circulated via suspect dealers and purchasers. Singular source countries, acting alone, cannot tackle all of the triangulations between looter, smuggler, dealer and buyer without the active support of neighboring countries, law enforcement and the art collecting community themselves. Yesterday's Cambodia, is today's Syria and tomorrow's Ukraine, as the grey market of antiquities shifts from one vulnerable nation or one conflict zone to another. January 17, 2015. 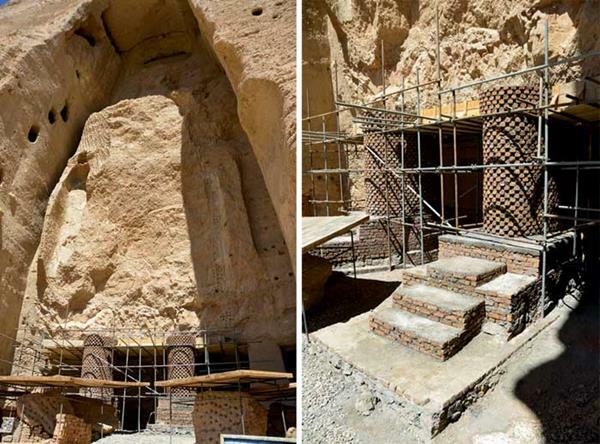 Archeological organizations and government interests in several nations are in conflict over the fate of the remains of Afghanistan’s giant Buddhas. Two giant standing Buddha statues in Bamiyan, Afghanistan were deliberately destroyed in March 2001 by Pakistani Taliban forces, who used first rocket launchers, then anti-tank mines and dynamite to reduce the 175 foot and 115 foot tall statues to rubble. Their destruction was captured on video by the Taliban and watched with horror around the world. The same month, Taliban destroyed most of the pre-Islamic art remaining in the Kabul museum by smashing it with sledgehammers. January 4, 2015 Sixteen original manuscripts from Timbuktu are on view until February 22, 2015 at the Centre for Fine Arts in Brussels in a special exhibition, Timbuktu Renaissance. The manuscripts are just a few of the hundreds secretly transported to Bamako the Malian capital, by representatives from the 32 private family libraries. The manuscripts were smuggled out of Timbuktu at the height of the 2012 conflict with jihadists who destroyed numerous shrines in Timbuktu. 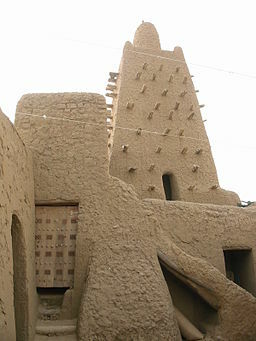 Timbuktu was a center for Islamic learning and law in the 15th and 16th centuries, and many small libraries preserving texts were established among families who held hereditary responsibility for their care. Thanks to the rescue operation, the majority of the ancient manuscripts were safely removed before jihadists broke into and set fire to known libraries.